The sultanate of Rum was established in territory in Asia Minor, formerly a possession of the Eastern Roman empire. It was one of a number of minor states to be created by the first mass migration of Turks from east of the Caspian Sea. After the main Seljuq force had conquered Persia and taken Baghdad, a splinter group defeated the Byzantines in Anatolia and founded Rum ('Rome'), initially under Persian Seljuq suzerainty. Rum, alternatively known as Konya or Iconium, was one of the most powerful Turkic Anatolian states. To its south, in Cilicia, the kingdom of Lesser Armenia was founded in 1080, while the Crusader state of Edessa was founded to the south-east in 1098. Vied for the rule of Seljuq Baghdad in 1063. 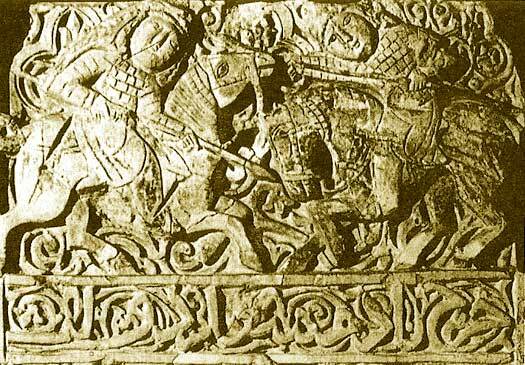 A unit of six hundred Alani fight in 1071 under the command of the Byzantines against the Seljuq Turks and a further six thousand men in 1074 fight against the Normans in Italy. This cooperation lasts only a short because the Alani are badly paid. Son. First sultan of Rum. Antioch is taken from the Byzantines and held for just thirteen years before it is lost to the Crusader principality of Antioch. The Byzantines are defeated at the Battle of Myriocephalon. Died unexpectedly of natural causes. Al Ashraf of Damascus has been growing more and more discontented with the overlordship of his brother, al Kamil I of Egypt. He forms an alliance with Sultan Kaikubad I and minor Ayyubid rulers with the intention of breaking al Kamil's hold on the region. However, both Kaikubad and al Ashraf die of natural causes in the same year, ending the alliance. The sultanate is struck heavily by the all-conquering Mongols and becomes a vassal state. The Seljuqs begin to disintegrate, despite attempts to retain the sultanate's cohesiveness. The sultanate collapses in the face of Mongol overlordship. Anatolia is ruled on behalf of the Mongols by a regional governor, with the Ottoman Turks making substantial inroads to the west. The Mongol sultanate of the Jalayirids establishes control over the region.